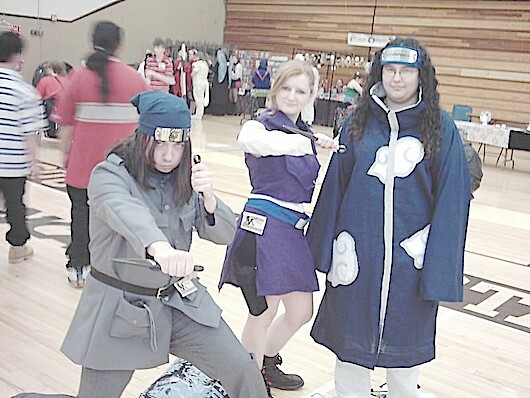 On May 20 thru May 22 there was an anime convention in Marshall, MN, USA that I attended. Actually my freind and I only got to go on the 21st due to work and other obligations, but the one day that I was there for was one of the funnest things that I have done. Over the next few days I will be documenting all the events that went on while I was there. Our journy started at 6am Saturday morning. This is what time we left my house at to head down to the convention. We had a four hour drive ahead of us and we wanted to make it there by 11am because Wendee Lee was going to be speaking at 11am and my friend is a huge Faye from Cowboy Bebop fan. So we got an early start and it worked out that I drove the whole way and my friend slept the whole way. (That seemed really fair) I had never been to UofM campus in Marshall so I didn't know what to expext. When four hours later we finally got down there I found out that it was a big collage in the middle of an even bigger corn field. (Not really, but it was surronded on three sides by corn fields.) It took us awhile, but we found the enterance to the convention and paid out $20(US) each for a Saturday pass. Tis was only the second year that the convention had existed and it was very cheap compared to some of the conventions that I have heard about. *Warning - This was the first time I used this camara and some of the pictures came out a little blurry. So please forgive me. This is the first person that I was able to get a picture of at the convention. If you haven't seen the series, this is Chi from Chobits. Now this is a guy that went above and beyond for his costum. Check out the arm. 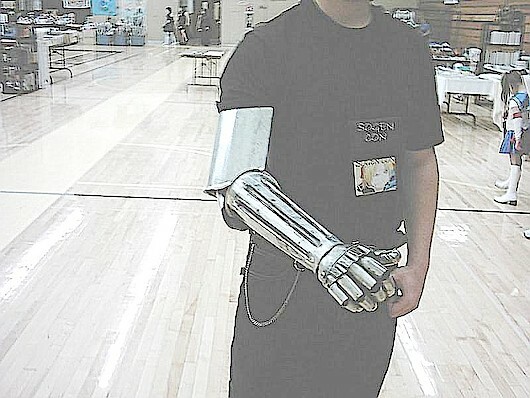 He told me he spent over a week working on just the arm. I was so envious. This is Ed Elric from Fullmetal Alchemist. I was suprised by the number of Eds I found during the convention. Ed seemed to be a popular characture this year. 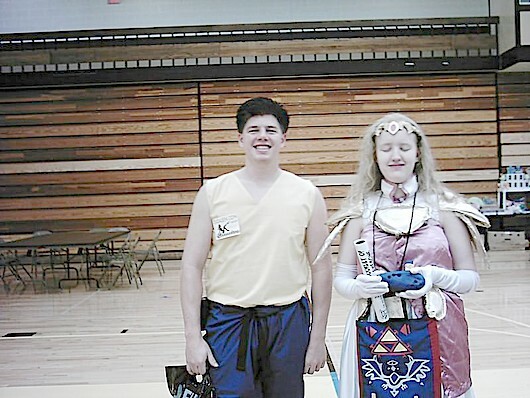 The two charactures in this picture are Yusuke Urameshi from Yu Yu Huksho and Princess Zelda from The Legend of Zelda. 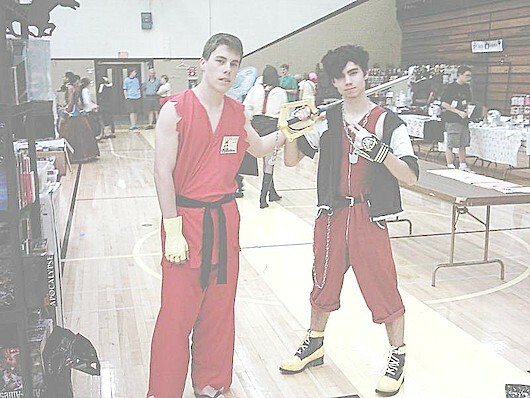 And in this picture we have Ash Katchum from Pokemon and Tira from the video game Soul Calibur 3. 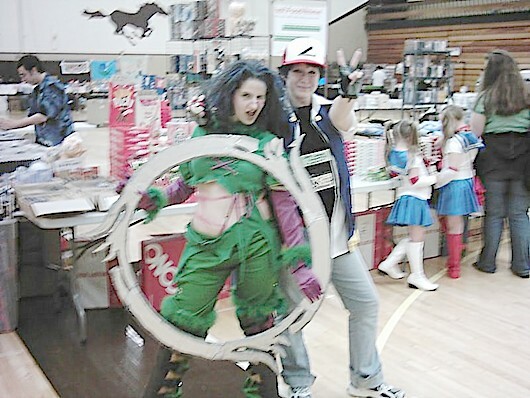 The young lady who is dressed as Tira was kind enough to email me and tell me who she was dressed as. Thank you. And next we have Anthy from Revolutionary Girl Utena. As you can see, many of these cosplayers are very detailed in there costumes. I am sorry to say that I am not sure who these to guys are either, but suneagle has suggested that the guy on the right might be Hatsuharu from Fuit Basket. The hair length doesn't match, but the hair color and coat match Hatsuharu, so suneagle is probably right. And here we have Sakura from Tsubasa. There are alot of things about this costume that you can't see in this picture because of the light, but she had an amazing amount of detail in this costume. She told me that she spent over a year working on it. Next we have Yomiko Readman from the ROD OAV series. The truth is that I couldn't firgure out who she was until she pulled out her paper "chain". It was pretty obvious after that. From left to right... The first girl I don't actually know who she is so any help would be appreciated. The middle characture is Robin Sena from Witch Hunter Robin. And the Last one is Sango from Inu Yasha. Well look what we have here, it is another Ed Elric. Like I said, you couldn't turn the corner without running into one. Just kidding, but I did count about seven of them. Sorry ladies, but I don't know who you two are suppose to be. Any ideas? And here we have Nicholas D. Wolfwood from Trigun. 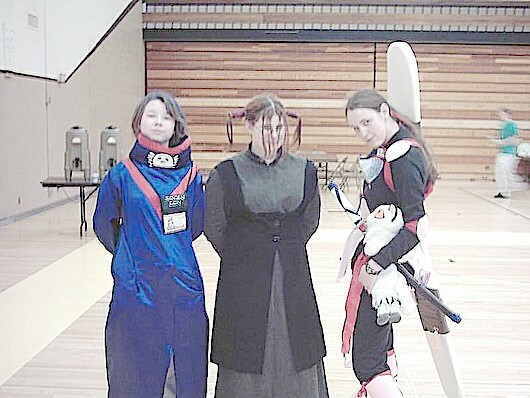 During the convention I had noticed that most of the cosplayers were female. I brought up this observation during one of the Q&A sesions and the explination that they had was that women tend to take better care of their costumes. I would tend to agree. I have been informed by Akari-chan that this is probably a character from To Heart, and seeing that she is a fan of the show I would asume that she is correct. Thanks Akari-chan. Next we have to guys. (Finally, some guys) The first is I believe Ken Masters from the Street Fighter series. To his right is Sora from the Kingdom Hearts video game. Next we have three charactures, all of which I do not know the names for, but I do recognize them as charactuers from Nutaro. And last but not least we have Vash the Stampede from Trigun. There were about four or five Vashs at the convention, but this guy was by far the best. I believe he was the best cosplayer there. (And that is saying alot considering the quality of the costumes that were there.) This guy had it all. His costume was extremly detailed. (It took him four years just to get all the materials toguather to make the sun glasses) And his attitude fit Vash completely. The guy was so full of energy he was literally jumping and running around, and he always seemed to be smileing or laughing. This guy was a dead ringer for Vash the Stampede. One of the things that I learned before I went to a convention is that you should never just randomly go around takeing pictures of cosplayers, you should Always ask their permision first. Most cosplayers are very nice and will usually pose for you because they are proud of there costumes. But some poeple don't like to have their picture taken. They think the camera will steal their soul. Of course I didn't just take pictures at Sogencon. There are alot of other things that I did while there. The first thing I did after I changed out of my cosplay costume,(I had to change because I had a wardrobe malfunction) was to head back to the dealers room and check out the diffent items for sale. Back in the dealers room they had alot of cool stuff. (even if they didn't have alot of vendors) I found plushies of just about every major characture in anime right now. There were wallscrolls to my left and right, anime dvd's, pictures, models, manga, japanesee treats... I was haveing the time of my life. Unfortunetly I was on a strict budget, so I could only look for the most part, I could only afford to buy a few things. But if I could have bought what ever I had wanted, I would have needed a semi to get all the stuff back to my house.